Our names are Madi Corvi, Lulu Girotti and Carly Von Halle we are participating in the Relay for Life along with seven of our other friends. Relay for Life is a fundraiser for cancer research. When the sun goes down at the Relay For Life event, hope shines the brightest. 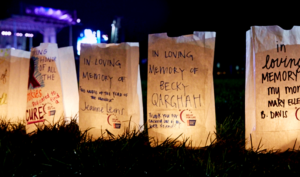 During the Luminaria Ceremony, hundreds of luminaria light the track or path to celebrate the lives of those who have battled cancer, remember loved ones lost, and fight back against a disease that has taken too much. This ceremony of light symbolizes the hope and perseverance with which we all continue to fight. You can give to Stepping for Smiles and keep the flame of hope lit by dedicating a luminaria in memory of someone lost to cancer or in honor of someone still fighting or who has beaten the disease. Our team will be taking the names of your loved ones that you have decided to share with us and be decorating the bags. Each bag will be handmade by our team and we will be sure to make them all unique and special in their own ways. They will look very similar to the ones below and as you can see they are made with care. If you would like you may add your email address if you want us to send you a picture of your luminaria all light up. All you have to do is fill out as many forms as you would like with a recommended donation of $5 per bag. We will be down in coffee hour this Sunday with the forms.